Chef Shelby Sewell shares her recipe for Jasmine Rice Cake appetizers made with Pickled Ginger, Wasabi, and Smoked Salmon. Chef Sewell is the owner of Sanctuary at Admiral, Foodz Catering, and Zinnia Bistro. 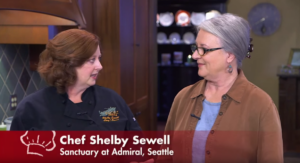 Watch an interview with Chef Sewell and learn more about her cooking philosophy.